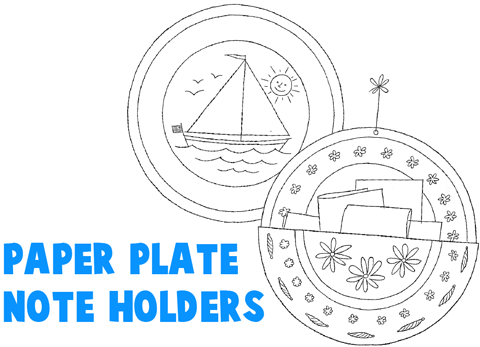 If you have a bunch of extra paper plates just sitting around, then you might want to do one of these arts and crafts projects that we have listed on this page. One of tehse crafts is to make some hanging artwork. The other craft is to make a hanging notes, receipts, or bill holder for the wall. If you decorate it right, it will look beautiful on your wall and it will keep the clutter off of the countertops. (1) You will need two paper plates for this one. Cut one plate in half. 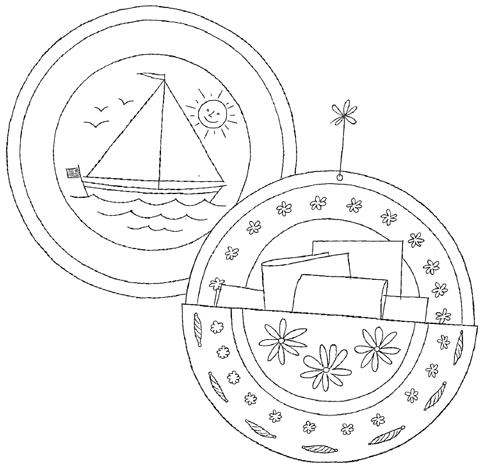 (2) Draw a design on the front of one plate and on the back of one of the halves. (3) Take the half plate and attach to the whole plate by lacing through holes punched along both edges. (4) Make a hole in the top, add string and hang. (5) Finish with two coats of shellac. (6) These may be used as wall hanging decorations if you attach a paper clip with some masking tape. This may be used to hold bills, receipts, notes, or whatever you want etc. (1) Use a package of plain 8" paper plates. Crayon a design heavily on the plate. A border may be made around the edge. (2) Then paint the entire surface of the plate with black tempera paint. The water paint will roll away from the crayon design leaving an interesting effect. (3)When the plate is thoroughly dry, finish with two coats of thin shellac, This makes on attractive, durable finish. (4) These may be used as wall hanging decorations if you attach a paper clip with some masking tape.